No reservations needed, just a thirst for adventure, so head for the wilds, where your new favorite campsite awaits. Finding your own secret osasis away from everything is the best part. As long as you're okay with a little adventure and some unknowns, you'll feel right at home even when your miles from it. Plus, with a little foresight and these tips you'll feel way more comfortable setting out to find one. Start with a good map. Locate the green areas on Google Maps and you're halfway there. Green means 'public,' as in National Park, Forest, Monument, etc. These areas tend to offer camping, and the National Forests and BLM lands are the ones with the most dispersed camping to be uncovered. Paper maps never runout of batteries, and they tend to be waterproof, two things most smartphones can't compete with. Grab some up-to-date maps before your trip or borrow ours. These can often be found at visitor's centers or ranger stations, so consider adding a stop there prior to setting out into the woods. Ask a local or a ranger. Above all else, local knowledge is a great resource no matter where you're traveling. Though many spots can be highly coveted secrets, it doesn't hurt to get first-hand info on current road conditions, things to look out for, and maybe even a whispers of a few hidden gems (provided you are respectful of course). Forest roads are the ones to follow. Often marked "Forest Rte 5N55," or a similar combination of numbers and letters, these road are usually graded dirt and provide your best access to the remote camping spot of your dreams. Arrive early. Without light it is always more difficult to not only pitch camp, but to find one in the first place. Allow plenty of time to explore before dark. Think of finding a nice spot as a part of your trip and not just the consequence of a day's end. Getting to the site early all but guarantees a better chance of finding a site unoccupied. No one likes a car's brights shining on their tent at 2 am, so this is a great way to respect your neighbors, if there are any, as well as find your own little slice of paradise. Drive! Get out there and explore. You didn't head out into the woods to experience the predicable, which nature certainly is not. Surprise yourself! This is what adventure travel is all about. Any trip out into the backcountry requires some forethought and of course a well prepared kit. 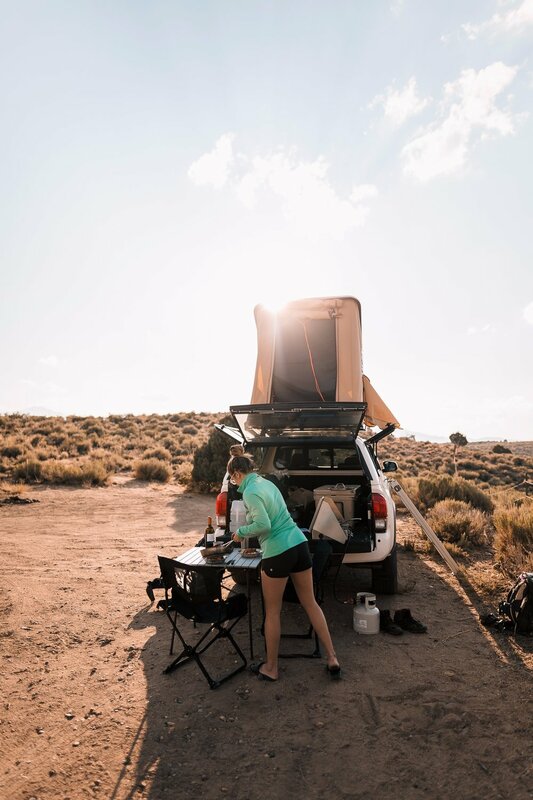 While the list of things to bring along can grow long, quickly, there are a few essentials to grab before you hit the (dirt) road. GPS and offline navigation are crucial for use beyond the range of cell towers. Anyone who's spent a night far beyond the city lights on new moon will see the occasional satellite streak across the night sky: They're out there and are providing uninterrupted location data to your smart phone even when the closest cell signal is miles away. This allows your phone to function like a GPS unit, so download a few map layers within apps like Google Maps, Gaia GPS, Pocket Earth, and Hema Maps, and you'll feel way more confident when you reach the next fork in the road. National Geographic now offers free printable USGS quad maps, which is another great resource. Pick up a fire permit. A permit is essential if you plan on having an open flame in the backcountry, and are required even if you only plan on using a gas stove to cook on. Stop by a ranger station or get one online. They're free and can save a forest from being lost to future generations of visitors. Quick note here, over 80% of "wild" fires are caused by humans, so take this very seriously. When nature calls be ready to answer. Carry enough personal hygiene products to manage your bodily needs in the bush and be prepared to 'pack it out' if required. That's right, not every location allows you to dig a cat-hole, so make sure to carry the appropriate waste management items. Cleanwaste toilet kits are a great option here, but when it comes time to dig make sure you: minimize the chance of water pollution, the spread of disease, and the aesthetic impact, while maximizing the decomposition rate. No one wants to see toilet paper hanging from the bushes, and animals can and will search it out, so dig at least 6-8 inches down and at least 200 feet from camp spots and water sources. Leave no trace. So whatever it is you decide to bring with you out on the trial, make sure to bring it back. Furthermore, if you see some trash, pick it up. Check out these 7 Leave No Trace Principals to help keep the wilds clean and green. By leaving a place better than how you found it you ensure that we'll have access to these amazing campsites for generations to come. Get out there and enjoy the wilds!